“I’m being quiet about it.” It’s a phrase that Beau Burdette, the founder and fragrance mastermind behind The Contents Co., uses often when discussing his work. It’s no surprise: Anyone who’s encountered the two-year-old line of candles, bath soaks, body mists, and room sprays knows it’s anything but flashy. The focus, instead, is on staying all-natural. “I don’t want to put a product out into the world without knowing everything about what goes into it,” notes Burdette, formerly the creative director of Rewined Candles and founder of its sister brand, Produce Candles. Working with vintage beakers and salvaged industrial equipment in a studio below the Karpeles Manuscript Museum, Burdette crafts his products from a panoply of carefully selected components. It all starts with the scents. “Our final formulas typically contain 15 to 30 natural plant oils and extracts,” he notes. “It’s the quality of the ingredients that determines the quality of the product, hence the name ‘The Contents Co.’” To perfect the “Lavand” scent, for example, Burdette tested 20 lavenders from around the globe before choosing his favorites to mix with clary sage, bergamot, and jasmine. Some fragrances are added to wax from United States-grown soy to make candles, while others are distilled to create mists and sprays, or combined with salts (Epsom, Dead Sea, Himalayan pink, and on) for bath soaks. With its wares sold at the Charleston Farmers Market, through thecontentsco.com, and by 20 retailers nationwide, The Contents Co. is also growing via product partnerships with the likes of Basic Kitchen and artist Raven Roxanne—but quietly, of course. 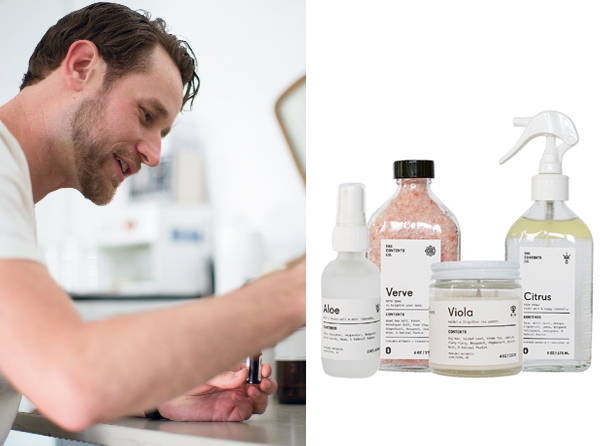 For the scoop on The Contents Co.’s perfuming process and a peek inside its studio, click here.